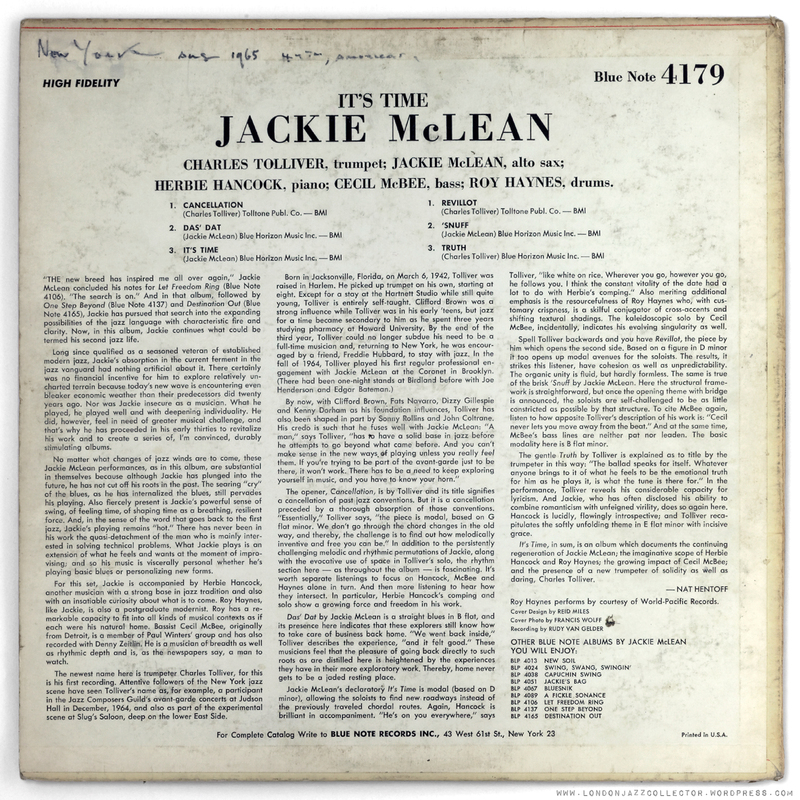 McLean had already mapped “far out” territory with a run of Blue Note titles. With It’s Time! 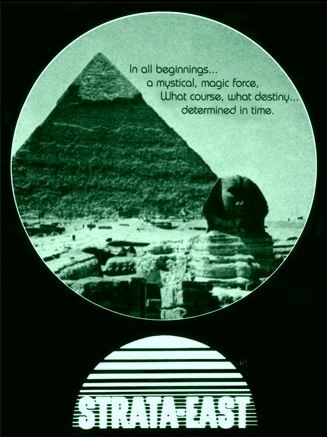 from 1964 he retraces his steps back to bop but with the insight of further-out. What is particularly exciting here is the conversation between Hancock and the front line. He spurs on McLean and Tolliver, poking and prodding them from all directions with melodic fragments, half started tunes, changes in direction, which they pick up and twist. It’s piano accompaniment, but not as we have known it. Roy Haynes is crackling on fire and bass stalwart Mcbee motoring powerfully to provide the rhythmic anchor, whilst Hancock’s jabbing chords step out from the rhythm section to add both harmonic exploration and a percussive driver. Added into into this potent modal mix is the relatively new trumpet voice of Charles Tolliver, who blossomed in the later ’60s, on dates with Booker Ervin, Andrew Hill and Max Roach. Though nominally a Mclean album, it has five strong minded voices, Hancock bouncing around all over the place, and a spotlight falling on Tolliver. The result is an energising sonic train-ride, with everything arriving musically at the right destination in time, the mid ’60s: It’s Time. Tolliver, who made his Blue Note debut on It’s Time!, recorded three albums with McLean. He was noted for his fluid and lyrical trumpet voice, in contrast with the looseness of the far out tendency. Together with pianist Stanley Cowell, Tolliver went on to found the Strata-East record label, specialising in 1970s Post-Bop, Spiritual Jazz, and Afro-Jazz. Still playing in his ’70s, he enjoyed a late-career resurgence, with explosive big-band performances, and recently played one night at Ronnie Scott’s with his Music Inc quintet, reviewed here by Guardian Jazz stalwart John Fordham. Vinyl: BLP 4179 – mono on NY labels, VAN GELDER stamp and ears. Both sides a van Gelder second shot, A-1 and B-1 master, and value for money with the grooves fully occupying the vinyl capacity, leaving just a small skinny trail-off. The cover would have benefitted from stronger lamination, or been kept in its shrink for a few crucial decades, but still, a great Reid Miles graphic design, if a little grubby. Written on the back in a flowing hand, the inscription “New York August 1965” exactly one year after the recording. Nice period authentication, preferable to the YOUR NAME HERE school of writing on covers. This McLean title had been off my radar a long while, never having seen an attainable copy in the wild, so it was a shock to walk into a London store, leaf through the “Blue Note” section expecting the usual suspects – Jimmy Smith and Stanley Turrentine – dodgy reissues and lesser titles, to find not one but two prize catches. Ouch! After months of lost auctions on ebay this is what you hope for but rarely encounter. All part of the fun of collecting records, but the corollary is also true. I remember a sports report somewhere when a footballer was asked how he felt about being dropped from the national team. Biting back a tear, he put on a brave face and replied “Disappointed“. The manager put his arm on his shoulder. “Son, disappointment is part of football“. 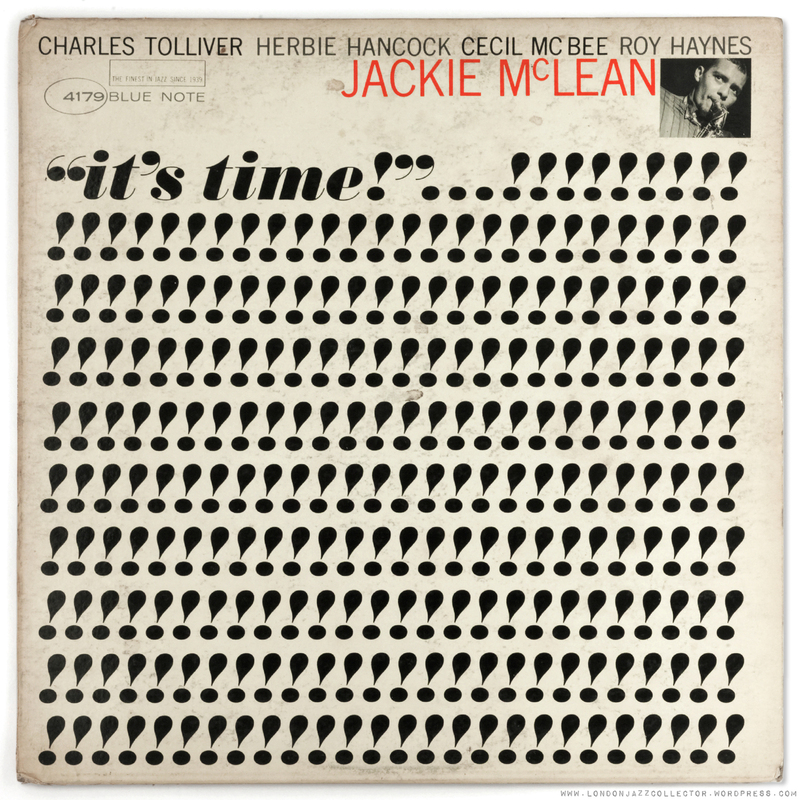 This entry was posted in Blue Note, Jackie McLean and tagged Blue Note, Cecil McBee, Charles Tolliver, Herbie Hancock, Jackie McLean, Roy Haynes by LondonJazzCollector. Bookmark the permalink. FJ: Who is and who isn’t an innovator is a contentious argument, but Bud Powell in particular always seems to be left out of the fray. After all, Powell, along with Monk, revolutionized the way the piano is played in jazz music. JACKIE MCLEAN: Fred, I would go further than that. I would say Bud is one of the architects of this music called bebop. He’s one of the people that developed the concepts within the bebop style. He is definitely, no question about it, one of the greatest piano players, if not the greatest stylist that ever played the piano. Thelonious loved to play Bud play his compositions. Thelonious always thought that Bud was a great interpreter of Thelonious Monk’s music. Bud loved Thelonious. He worshipped him as an idol. Charlie Parker was the great player at that time, that whenever he was on the bandstand playing, everyone else played, except for Bud. Bud always played up to the highest standards of Charlie Parker. He played as well as Charlie Parker, sometimes better. At the time, Bud had a great influence on me, in terms of building ideas and thinking of lines to play, as much as Charlie Parker. Yes! In Kerouac’s “On the Road, the quintessential hipster book, there is a scene where the protagonist must stop in NY to see Charlie Parker play. It gives an impression that it’s the most significant experience in his life and that he was drawn to the event by magnetic forces. It’s not the greatest prose I’ve read, but still gives interesting insight into the opening of the American hipster and subsequent hippy scene. My next project is a careful reading of Alexander Pope’s “An Essay On Criticism.” I couldn’t penetrate the work when I was young but now find it opening up to me. Thanks for sharing your thoughts on this LJC. I have had this ‘in stereo’ for years now and always thought it difficult. Which is strange, because when I first heard it I was enthralled. Okay, so I pulled my copy down from its resting place on my record shelf, and I am now listening to it with a different set of ears, so to speak. i love that feeling. recently happened to me with a NY label copy of “cooking with the miles davis quintet”. congrats on the score! For me with a relaxin original in NY! don’t wanna let us know ’bout the second one? Coming up shortly, next post. Our secret, its a Horace. While I have your attention, I have copied the links page of the Dottor Jazz Guide to 1st Pressings to its own permanent page here at LJC. I have added my first attempt at creating a birds eye view of all the labels in a running series, twenty per page, starting with all the 1500 series releases. Works in progress. good! why not picking the two missing from my (our) guide? Duh! I was workin’ with an earlier Word edition as it’s easier to extract the pictures, so I was not up to date. With a little fancy footwork from the PDF the birds-eye view is now complete, no missing now. Interesting how artists names were included on the label, but not when there were too many track titles to cram in. I had never noticed that before.